The confocal chromatic measurement principle works by focusing polychromatic white light onto the target surface using a multi-lens optical system. The lenses are arranged in such a way that the white light is dispersed into a monochromatic light by controlled chromatic deviation. A certain deviation is assigned to each wavelength by a factory calibration. Only the wavelength that is exactly focussed on the target surface or material is used for the measurement. In terms of thermal stability, confocal sensors are more stable than laser triangulation or eddy current sensors. 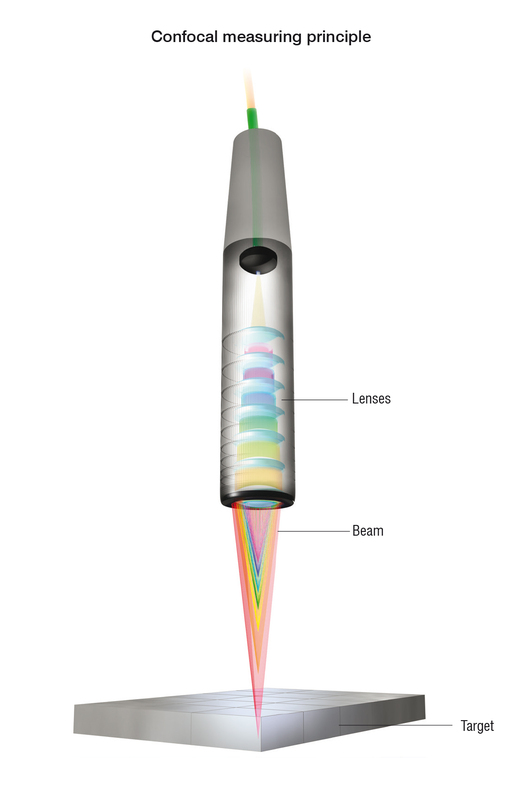 This is due to the design of the sensors, which typically comprises a cylindrical tube with a series of optical lenses. The sensor is considered “passive”, as the controller and electronics are housed separately and so can be located further away from the target object, which normally means they can be mounted in a more controlled temperature environment. As confocal sensors are considered “passive”, i.e. do not contain any electrical components, they are suitable for vacuum applications in semiconductor and microelectronics production. In clean rooms or vacuum environments, specific confocal sensors can be provided to suit either a low level vacuum or an ultra high vacuum with zero outgassing. As there are no electronic components inside the sensor, this means the sensors do not emit any heat radiation during operation, which in turn prevents mechanical expansion of parts inside the sensor or the target being measured. The result is a much more stable, accurate sensor. Confocal chromatic sensors provide significant advantages when it comes to inspecting the shape, size and surface topography of MEMS (micro-electromechanical systems) structures during or post-production. These benefits include extremely high sensitivity and sub-micrometre resolution. The sensors can also be integrated to linear X-Y stages, machine tools or special purpose inspection systems with closed loop feedback control. Confocal sensors are capable of measuring the surface finish and groove depth of difficult materials, ranging from highly reflective, mirrored surfaces to dark, diffuse surfaces. Traditionally, most confocal controllers perform poorly when trying to compensate for difficult and changing surface conditions, particularly in high speed surface scanning tasks. However, the latest confocal controllers from Micro-Epsilon use intelligent software algorithms based on the company’s experience in the design of optical laser sensors. These algorithms enable the controller to compensate in real time for surface reflectivity, enabling users to scan surfaces very rapidly at high resolution. The controllers also provide high speed triggering that allows them to be synchronised with encoders and other motion control devices. The result is a controller that provides more stable, higher accuracy measurements, down to nanometre resolution if required. Laminated safety glass, solar panels, flat screens and smartphone displays comprise multiple layers of different transparent materials. Measuring the exact thickness of these individual layers, as well as any air gaps between these layers, during production is a critical but physically complex process and a challenge for measurement technology. For quality inspection and process control of manufactured transparent multi-layer materials, confocal sensors and controllers can together provide multi-peak measurement capabilities for multi-layered materials such as glass. The result is improved product quality and increased production yields for manufacturers. These confocal sensors and controllers offer faster measuring rates, improved signal-to-noise ratios, and real time surface compensation for difficult-to-measure surfaces, including mirrored surfaces. Some suppliers such as Micro-Epsilon provide software that can evaluate up to five layers by evaluating six measurement values on the boundary areas. In order to accurately determine the thickness of each layer, the controller retrieves the refractive index of each material layer from a database. Each refractive index is corrected depending on the wavelength. There are some limitations when using confocal technology. The operating environment for the beam path must be relatively clean and free of dust, dirt or fog, although not to clean room standards. In addition, measuring ranges are relatively small compared to other non-contact displacement technologies such as laser triangulation. The largest measurement range is typically 30mm, although sensors can still have relatively good stand off distances from the target being measured. The controller needs to be separate from the sensor, which in some applications, can actually be a benefit rather than a hindrance. For example, where the sensor is measuring very hot targets or is mounted in a hazardous environment, the controller can be installed at a safe distance away from where the measurements are taking place. In terms of operating temperatures, confocal sensors typically withstand ambient temperatures up to 50°C, although sensors can be protected for hotter environments with enclosures, air cooling and a protective window.